2015 has been considered as the base year for company profiles. Whenever information was unavailable for the base year, the years prior to it have been considered. 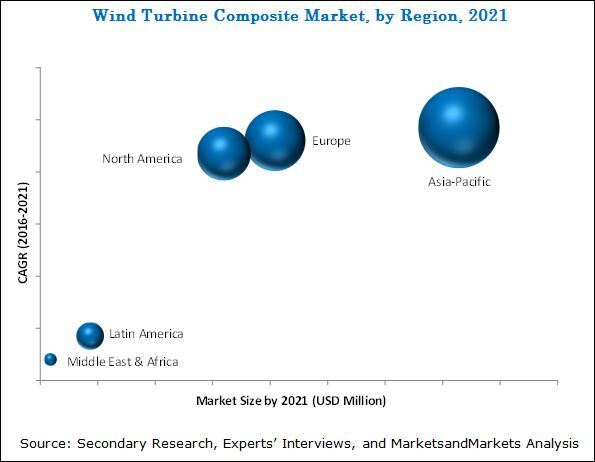 Various secondary sources such as company websites, encyclopedias, directories, and databases such as Composite World, Factiva, and American Composites Manufacturers Association, among others have been referred to understand and gain insights into the wind turbine composite market. Experts from top wind turbine composite companies have been interviewed to verify and collect critical information, and to assess the trends in the wind turbine composite market during the forecast period. The top-down, bottom-up, and data triangulation approaches have been implemented to calculate the exact values of the overall parent and individual market sizes. Wind turbine composites comprise two major raw materials such as fibers and resins. Established raw material suppliers include Hexcel Corporation (U.S.), Huntsman Corporation (U.S.), Toray Industries (Japan), Teijin Limited (Japan), and Owens Corning (U.S.), among others. Key players in the wind turbine composite market include TPI Composites, Inc. (U.S.), Suzlon Energy Limited (India), and Vestas Wind Systems A/S (Denmark), among others. This research report categorizes the wind turbine composite market on the basis of resin type, fiber type, manufacturing process, application, and region. It forecasts revenue growth and analyzes trends in each of these submarkets till 2021. The wind turbine composite market is projected to reach USD 12.17 Billion by 2021, at a CAGR of 9.28% from 2016 to 2021. The increasing demand for composites that help enhance the strength and stiffness of structural parts of wind turbines, such as blades and nacelles, among others is driving the growth of the wind turbine composite market. Composites are used to manufacture varied parts of wind turbine such as blades and nacelles, among others. The wind turbine composite market has been segmented on the basis of resin type, fiber type, manufacturing process, application, and region. Among all applications, the blades segment accounted for the largest share of the wind turbine composite market in 2016, in terms of value and volume. The use of composites in wind turbine blades provides long shelf life, less maintenance, resistance to corrosion, and high strength-to-weight ratio. Based on fiber type, the glass fiber segment accounted for the largest share of the wind turbine composite market in 2016, both in terms of value and volume. Good strength, chemical resistance, and good stiffness offered by glass fibers and their easy availability and cost effectiveness are key factors propelling the demand for glass fiber composites. Asia-Pacific is projected to be the largest and the fastest-growing region in the wind turbine composite market during the forecast period. Major factors driving the growth of the wind turbine composite market in this region are increasing demand for renewable energy sources, high demand for lightweight and high strength materials used to manufacture various parts of wind turbines, and supportive government initiatives such as favorable policies, wind power development programs, government regulations concerning renewable energy, and adjusted feed in tariffs for land-based wind power installations. In addition, key players such as Suzlon Energy Limited (India) and AVIC Huiteng Windpower Equipment Co., Ltd. (China) have their manufacturing bases in the Asia-Pacific region. The wind turbine composite market demands the moderate use of carbon fibers, as these fibers offer high strength-to-weight ratio and greater durability to the structural parts of wind turbines, such as blades and nacelles. Presently, the average cost of carbon fiber is USD 35/kg. The high price of carbon fiber as compared to glass fiber is hindering the growth of the wind turbine composite market. In addition, recyclability issues of composites owing to complex material compositions and the cross-linked nature of thermoset resins are additional factors hindering market growth. TPI Composites, Inc. (U.S.), Gamesa Corporation Technology (Spain), Vestas Wind Systems A/S (Denmark), and Suzlon Energy Limited (India) are key players operating in the wind turbine composite market. Major companies have adopted the agreement strategy for strengthening their position in the wind turbine composite market. Other companies have adopted various organic and inorganic growth strategies such as new product developments, expansions, and acquisitions to strengthen their market shares.